A thick file of the UK Prime Minister’s correspondence just released by the National Archive in Kew and which covers the period from 1 May 1980 to 22 August 1991 – most from Margaret Thatcher’s time in office reveal – despite the cool tone of the official notes and memos – just how friendly and convivial the relationship between Thatcher and Robert Mugabe really was. 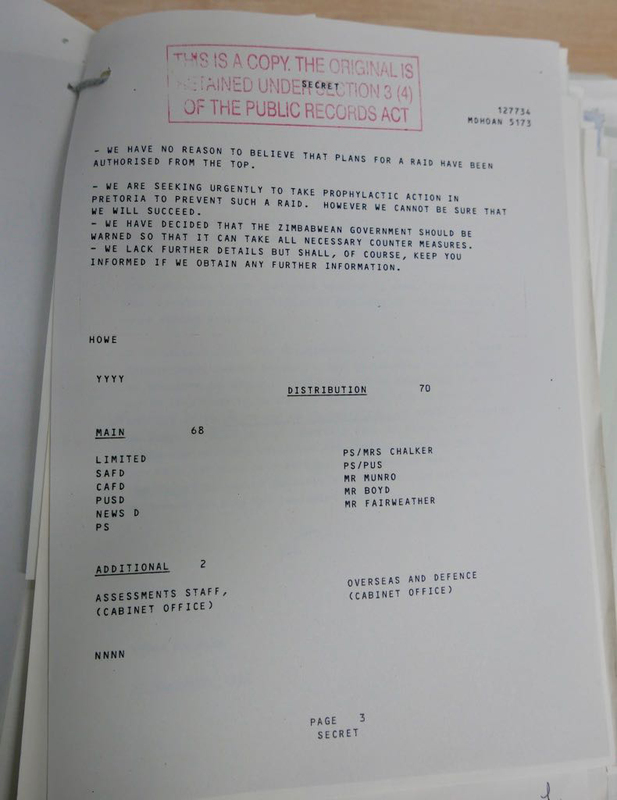 At 6pm on 23 September 1988 the Foreign Office sent a secret telegram, marked “flash” – immediate action – to its embassies in South Africa, Zimbabwe and Mozambique. British ambassadors were to alert the respective governments of an “imminent” raid by “British nationals and mercenaries recruited in the UK to free South African agents imprisoned in Harare”. 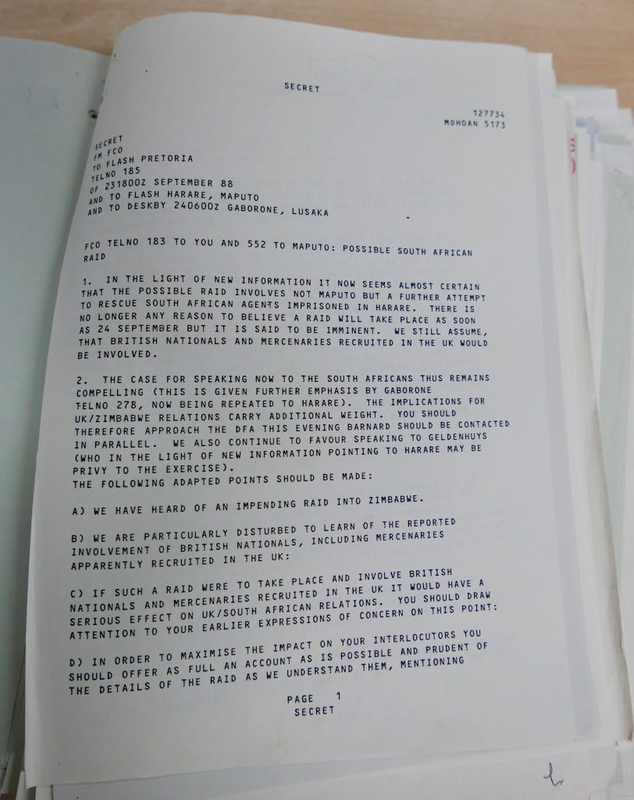 Robin Renwick, Britain’s ambassador to Pretoria, was instructed to contact Department for Foreign Affairs “tonight’, as well as Niels Barnard, director-general of National Intelligence, and General Jannie Geldenhuys, Chief of the Defence forces since, as the telegram put it, he “may be privy to the exercise”. Renwick was to make it clear that if any such raid took place it would have “a serious effect on UK/South African relations” – just at a time when international economic sanctions against the apartheid state were ratcheting, and talks around South African’s intervention in Angola was at a crucial stage in New York. The South African “agents” in Chikurubi, Harare’s maximum security jail, were part of an SADF team that had been sent into the country by the Civil Co-operation Bureau. Despite its innocuous name, the bureau controlled Pretoria’s notorious cross-border attacks against the African National Congress and other liberation movements, who were operating in South Africa’s neighbouring states. The British intervention had done the trick. The telegram is just one document from a thick file of the Prime Minister’s correspondence just released by the National Archive in Kew. Covering the period 1 May 1980 to 22 August 1991, most are from Margaret Thatcher’s time in office, with a few from her successor, John Major. These documents reveal – despite the cool tone of the official notes and memos –just how friendly and convivial the relationship between Thatcher and Mugabe really was. On 1 October 1988 – shortly after the aborted raid on Harare – Thatcher entertained the Zimbabwean leader at Chequers (the Prime Minister’s country retreat). They held lengthy “almost gossipy” talks in what was described as an ‘excellent atmosphere’. Both leaders were determined that their bilateral relations should not be adversely affected by public disagreement over policy towards apartheid South Africa. Thatcher expressed her disappointment at how little progress had been made, despite “constantly” trying to bring home to President PW Botha the risks he faced in not acting, and the need to free Nelson Mandela. Mugabe agreed, saying that “constant pressure” was needed and asked whether Thatcher might consider a visit to the country since he believed Botha would listen to her. 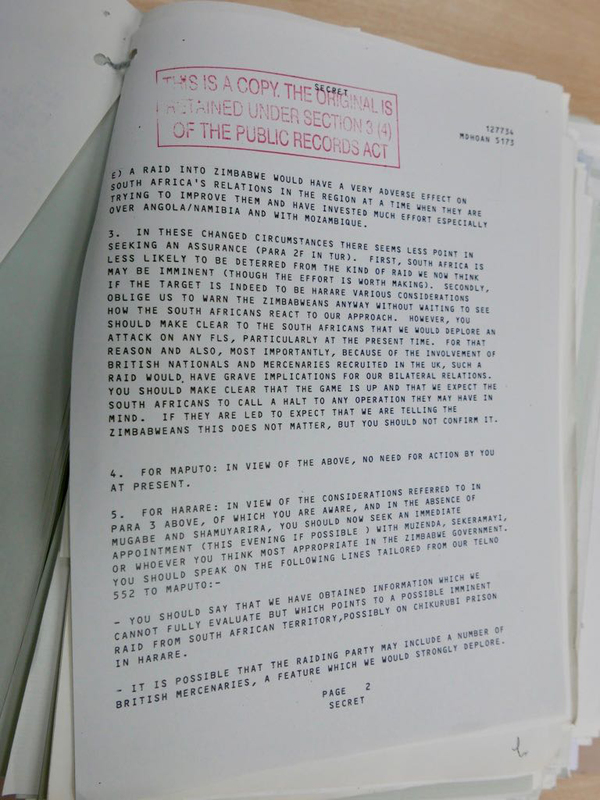 Thatcher confirmed that she would continue to send messages to the stubborn South African president but didn’t feel the time for a visit was right, since insufficient progress had been made on abolishing apartheid. Mugabe also told the Prime Minister he “hoped very much” she would take up his invitation to visit Zimbabwe in the coming months, but Thatcher only committed to looking at her diary. According to the files, Mugabe met the British Prime Minister whenever he was passing through London. There are no fewer than 11 visits recorded, from formal receptions to informal chats. It was only in November 1983 when the Commonwealth was meeting in Delhi that the two leaders had anything that could be described as a prickly encounter. In Delhi, Mugabe was frank about his deteriorating relationship with his former nationalist rival, Joshua Nkomo. He accused Nkomo of “bitterness” at losing the first post-independence election in 1980, and of having “broken ranks,” receiving military equipment from the Soviet Union after the election, including SAM 7 surface to air missiles. Mugabe accused his rival of purchasing 25 large farms to store weapons and act as training bases. And – he said – they had “deliberately” not integrated their “crack troops” into the new army the British were helping Zimbabwe build. This was – according to Mugabe – the “zero-hour” plan: an attempt to overthrow his government. It was Mugabe’s explanation for the ruthless repression in Nkomo’s heartland of Matabeleland in the 1980’s during which tens of thousands were killed. Mugabe was particularly incensed at British political and media criticism of the detention and torture – something he strongly denied – of six white Zimbabwean air force officers. He furiously declared he would not accept direction from outside of Zimbabwe. Furthermore, it was unwarranted: he had been on the point of releasing three of those in detention. Despite her later public image of intransigence, Thatcher was capable of considerable charm. She explained, almost apologetically, the pressure she had come under from the press and from her own party in parliament, asking Mr Mugabe to understand. She referred to him as “a religious man” of integrity. “Everyone who knew him knew that he was incapable of corruption and everyone who met him thought highly of him.” Rather grudgingly, Mugabe accepted her explanation and she promised to find a new formula for raising such issues in public.